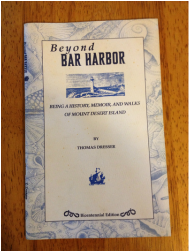 Beyond Bar Harbor is a story of the history of Somesville, Maine, as told from the perspective of my family, but encompassing the historical significance of the area. Set on Mount Desert Island, Beyond Bar Harbor is a tribute to the rocky shores and pitted mountains of Acadia National Park, and families who lived, loved and vacationed there. Read the story to garner memories of my youth, gain a semblance of the island's history, and learn about attractive, enticing hikes through Acadia National Park. Now available through Acadia Publishing in Bar Harbor, Maine and sold through Sherman's Bookstore, Main Street, Bar Harbor. Effective May, 2016, in honor of the centennial of Acadia National Park, Beyond Bar Harbor is now only $5.95. Write thomasdresser@gmail.com to order your copy today!